So Sew Mama has gathered a group of amazing bloggers ( including me! *smiles* ) to bring you all this great giveaway. 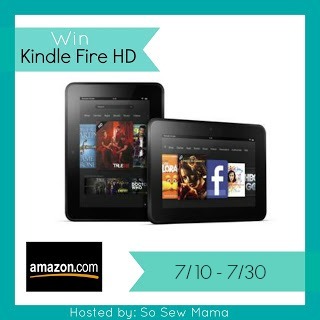 Up for grabs is a Kindle Fire HD which you can use for Facebook, watching movies or read your favorite e-book! All you have to do is join, follow the mechanics and do everything for more chances of winning! Blah blah blah (Rants and Raves of a Bum) was not compensated for this post, and is not responsible for prize fulfillment. This giveaway is not affiliated with Facebook, Pinterest, Twitter, or any other social media website. Please contact Desiree at So Sew Mama with questions, or to have your company/product featured in our next big giveaway! Read my Full PR disclosure here.